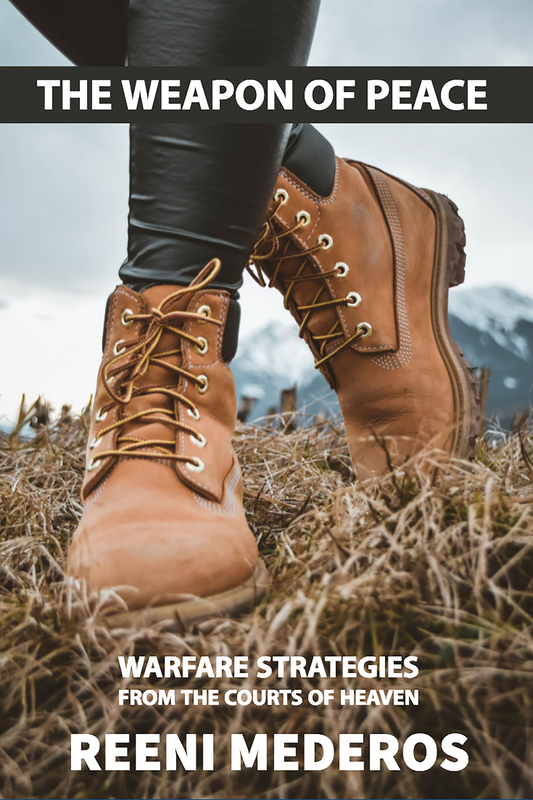 Reeni’s Book Reveals: MUST HAVE strategies to KILL ACCUSATIONS and to disengage ILLEGAL WARFARE once and for all with the strategy of God’s SHOES OF PEACE! This 100 Page revelatory E-Book or Paperback is power-packed with COURTS OF HEAVEN principles on how to say good-bye to UNNECESSARY WARFARE caused by OPEN and ACTIVE ACCUSATIONS and to say hello to one of the most neglected weapons of we have in our spiritual arsenal, THE WEAPON OF PEACE! Watch those accusations come tumbling down! The Weapon of Peace is power packed with fresh revelation and practical prophetic insight that God has given to the author, Reeni Mederos, in the midst of her own spiritual battles when accusations were raging during a time of personal crisis. Reeni reveals that as Christians, our shoes of peace are the most neglected pieces of battle gear within the full armor of God mentioned in Ephesians Chapter 6. Satan has used our own battle strategies against us to wear us out through direct combat with him while having unresolved open accusations screaming at us. We have learned many rules of engagement in the body of Christ, but we have unknowingly engaged in illegal spiritual warfare outside of the principles of the courts of heaven protocols. Reeni teaches you how to identify the open accusations against you and your bloodline and how to silence them once and for all as you discover and dive into the mystery of the Weapon of Peace. The Weapon Of Peace is Awesome and very Insightful as part of the Arsenal of God. Prophet Reeni Mederos really did her homework on this one. This book is a must for all who have fought in the realm of Spiritual Warfare. I am glad I have this book as a part of my own personal Arsenal. God Bless you Prophet Reeni for a job well done! This book is dynamite in a small package, The Lord is doing a new thing, but many are unaware. The book with all of the wisdom, prayer, and insight is of the Lord for this season that we are in. If you have prayed relentlessly, maybe even for years and not seen breakthrough, it is time for a change. This book is Scripturally sound and is much needed by all who need to walk in the peace of the Lord. You will find out how when you read it. Founder of Mysterion Expressions, Inc.
Reeni Mederos is the founder of Mystérion Expressions and Mystérion Academy and is a revelatory motivational speaker, author of “The Weapon of Peace,” and pioneering seer and a fiery prophetic psalmist who releases the fire of Seraphim with a passionate love for Christ in her spontaneous worship over cities, regions and nations, piercing individual lives with her contagious passion for Christ and adventuring the realms of the kingdom following hard after God. Reeni has been activating the Body of Christ into God’s supernatural realms for over 20 years with her online schools, live broadcasts and webinars, and on-location activation encounters, helping others to discover and fulfill their God-given destiny scrolls. Don’t miss this special personal mentoring weekend during Reeni’s book release to receive your personally signed copy along with getting your picture taken with Reeni during this powerful event as she teaches from her new book up close and personal. Get notified when newsletters, live events, conferences, teachings, devotions, music are released...and much, much more!